The rental company of aerial work platforms Riwal, exclusive distributor of JLG manufacturer in the Netherlands, converts diesel boom lifts to 100% electric thanks to its expert technical team led by Nico den Ouden, International Technical Consultant of the group. On June 15th, celebrating its 50th anniversary, Riwal formalized the sale of the first 43m fully electric JLG 1350SP boom lift to the Danish company Steiness Liftcenter ApS, also specialized in AWP rental. 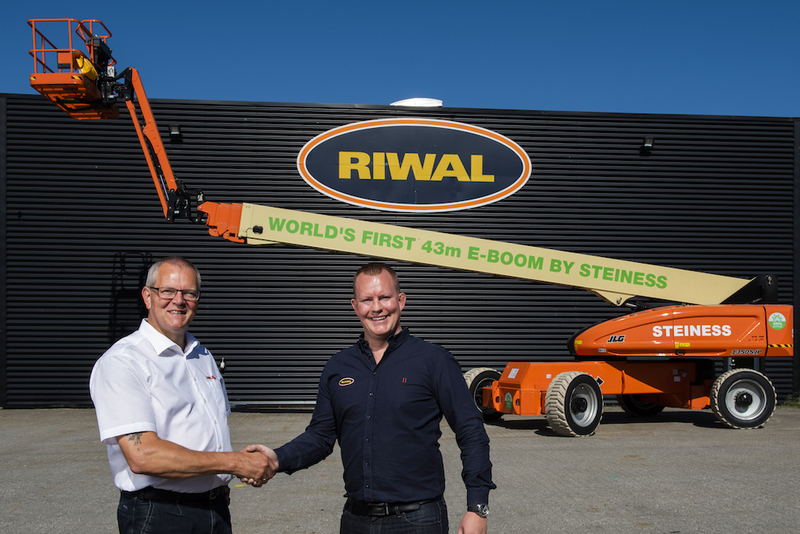 This transaction, which is world premiere in this boom lift category, is part of the Riwal’s project to extend its fully electric models fleet because it’s « a sustainable alternative to diesel powered machines while maintaining all of its features », as pointed out by CEO Norty Turner. The JLG 1350SJP, with 24m horizontal outreach, can be used inside and outside and its noise level is below 70 Dba.